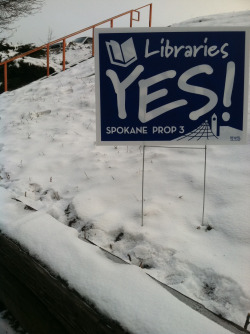 Blue and white signs supporting the Spokane Public Library's tax levy for the February 12 special election are popping up all across town. It's part of a well-organized effort to raise money for the city libraries, which are facing cuts. Library supporters aren't just throwing up a couple dozen signs, either. "Seven hundred and fifty yard signs, a mailer that goes out to 24,000 people, [and] we started phone banking" last week, says Spokane City Council President Ben Stuckart. "We're on track to dial 20,000 numbers." That's an intense campaign for a election that happens on Feb. 12, in just three weeks. Will the anti-library crowd push back in like fashion? Remains to be seen. For more City Hall Eyeball, head here.